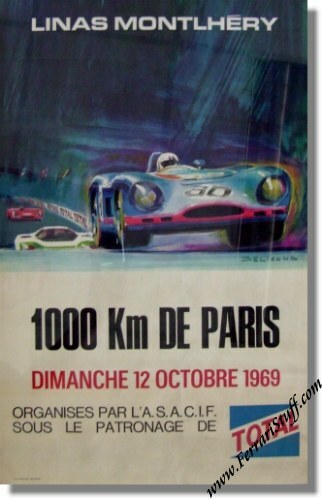 Vintage 1969 1000 KM of Paris Poster. The race was won by Jean-Pierre Beltoise & Henry Pescarolo in their Matra MS650. Only 1 Ferrari was entered in this race which was the Ferrari 275 GTB Competizione of Jacques Hanrioud and Jean Sage S/N 9007GT which did not finish the race. Please note that this poster has been folded, hence the reduced price !